Berkshire Hathaway chief and respected investor Warren Buffet believes Apple should use its cash pile to buy back more stock while it's at a depressed value, comparing it to buying dollar bills for 80 cents. Apple Chief Executive Tim Cook should work on building his company's value, rather than worrying about pushing the stock price up on a daily basis, Buffett said in an appearance on CNBC's "Squawk Box" on Monday, as summarized by Apple 2.0. Buffett commented on Apple as part of a three-hour appearance on the program. The Berkshire CEO admitted that he talked with late Apple co-founder Steve Jobs about what Apple could do with its cash. He believes the best use of Apple's $137-billion-and-growing cash pile is to buy back stock at a reduced price. 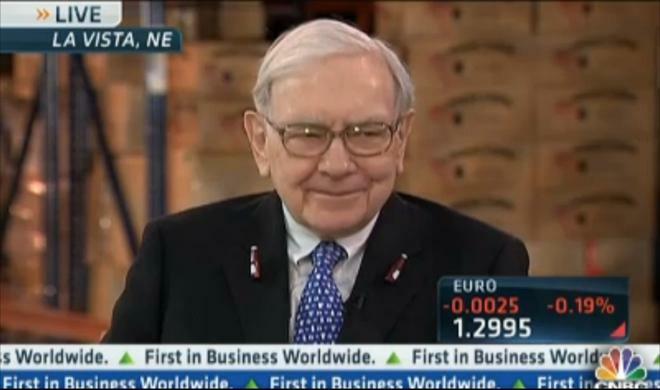 "If you could buy dollar bills for 80 cents, it's a very good thing to do," Buffett said. Beyond that, he believes Apple's best strategy is to simply run its business well. If Cook can continue to do that, Buffett believes shares of AAPL will respond accordingly. As for hedge fund manager David Einhorn's push for Apple to offer "iPref" preferred shares, Buffett believes the best thing for Cook and Apple to do is ignore it. He noted that his own Berkshire has lost 50 percent of its stock price four times in its history. "When that happens, if you've got money, you buy it," he said. "You just keep working on building the value." And while he admitted Apple may have "too much" cash, he said one reason for that could be the fact that Apple has not yet been taxed on two-thirds of it, which is kept overseas. While Buffett doesn't own shares of Apple, he has been positive on the company's outlook for some time. In an interview back in 2010, Buffett said he believed Jobs had done a "terrific job" at the helm of Apple. Apple and Berkshire Hathaway also shared the spotlight last week, when both companies appeared in the top 10 on Fortune's "Most Admired" list of companies. Apple took the top spot on the annual list, while Berskhire came in 8th.